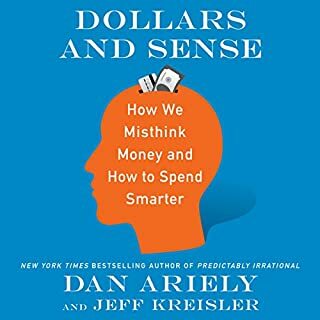 Drawing on the same experimental methods that made Predictably Irrational one of the most talked-about bestsellers of the past few years, Ariely uses data from his own original and entertaining experiments to draw arresting conclusions about how and why we behave the way we do. 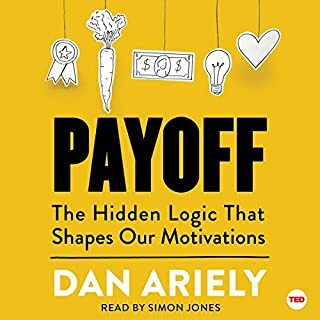 From our office attitudes, to our romantic relationships, to our search for purpose in life, Ariely explains how to break through our negative patterns of thought and behavior to make better decisions. 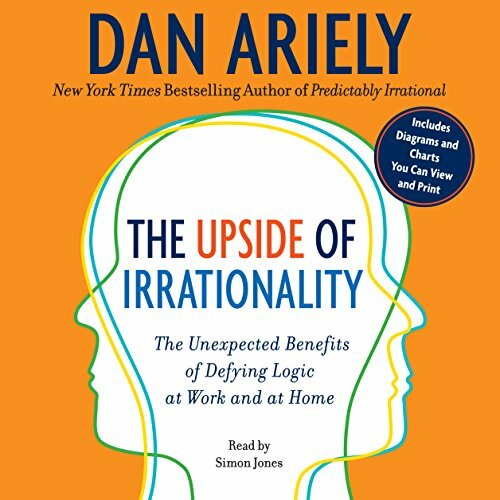 The Upside of Irrationality will change the way we see ourselves at work and at home and cast our irrational behaviors in a more nuanced light. I gave 5 stars to Predictably Irrational also by this author. This current book is not nearly as good. The title is somewhat misleading, as after listening, I'm not sure what he believes the upside to irrationality is. This book is shorter in length and seems to jump from one concept to another without much a clear connection or bridge between the chapters. On the plus side, he develops exceptionally clever experiments to test his theories. the difference between the original book and this, is there is lot more room for alternative explanations in this book. For instance, he sets up experiments where behavior is measured by the amount of money the subjects keep, give away or are influenced by. However, in my mind, I would have reacted differently to the situations based on thee amount of money involved. For instance, my behavior if sharing parts of $5 would be very different from sharing parts of $5000. Also, in some 'games' he set up it would matter to me if knew we were going to play the game more than once. In some of his games, this would greatly influence my behavior. Last, the source of his subjects may influence the outcome. Many of his experiments involve MIT students, who you could argue are not the 'normal' population of people. He also spends a great deal of the book talking about his own horrific experiences as a teen age burn victim. However, I am unsure of the purpose of providing painful, tortuous details of his suffering to the reader of this book. The most interesting (to me) chapters deal with how long the consequences of emotional irrational decision making can haunt us. Also, he demonstrates how specific stimulus can increase the likelyhood of irrational decisions. I can't help but wonder if the author wasn't try to put us in a certain state of mind with his personal horror stories - perhaps to buy his next book? You likely find more to like than dislike about this book but it's not as good as the first. Worth a listen to but not as good as the first book. Do not regret listening to though. I might be facing burnout on this type of book but I was not as gripped or stimulated by it as I was Predictably Irrational. This seemed somewhat like "it worked once, let's put more of the same out there". I generally like Dan's work but I wouldn't highly recommend this book. Sure, if you can't get enough of this irrational stuff, go for it. I personally think enough has been written on the subject. I found myself nodding enthusiastically at the points mentioned in this book. 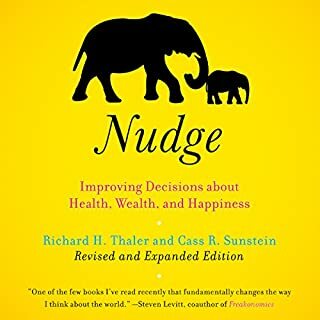 I believe it's a must read for everybody who has ever wondered why "rational" approaches fall short, and what to do about that. Great book. 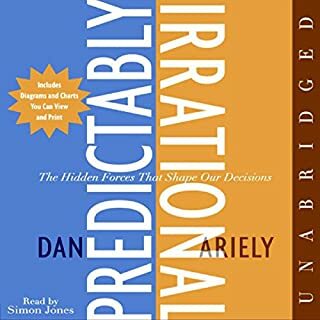 Much more personal than his first book, Predictably Irrational, the Upside of Irrationality helps us understand the benefits of our screwed up brains and illogical behaviors. Ariely is one of those truly inspiring people. His story of overcoming pain, of using pain to understand and explain the world, is an amazing motivator to all of us to stop whining about our own obstacles. I think Ariely is a genius in a very particular way - a genius in the construction of experiments to test ideas. A craftsperson of experimentation. 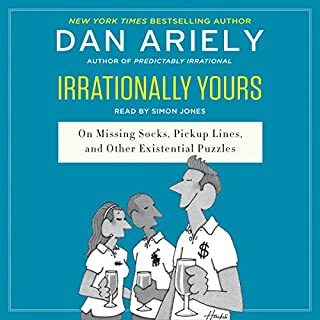 This is my second Dan Ariely book, I’m not sure why people said it wasn’t as good as predictably irrational and that the ideas were the same. They weren’t, this book was different, it followed the same approach but offered new areas in which it was questioning. I like the wit and humor that goes into the style of his writing when trying to talk about scientific concepts.. I have a few more books I also bought and am looking forward to listening to them. some of the same stories that he has shared with new information that puts the stories in a new light. Yes. This is a fascinating book. An unfortunate life experience caused the author to be in a position where he was pretty much forced to observe human interaction as a third party. This led him to a career in behavioural science, and to conducting a series of experiments to understand human behaviour. 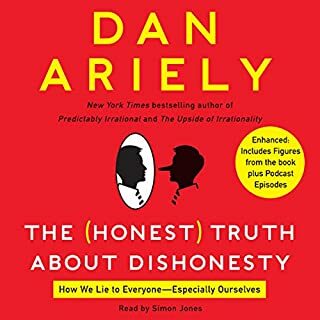 This is Dan Ariely's first book and it is a fascinating insight into the way the human mind works, and how we appear to be hard wired to make similar mistakes over and over again. This is a bit like the Matrix. When Mr. Ariely's findings are revealed, it is difficult not to see them all around us. So, what's it going to be, the red pill or the blue pill? Go on, you'll enjoy this. Another winner - this does not repeat Predictably Irrational but adds and enhances. One criticism is threat the promised 'Upside' is a framed subjectivity as far as humanity goes. But for me it point out my frailties so I can improve making this a real self-improvement book rather than just an interesting knowledge enhancer. Would you listen to The Upside of Irrationality again? Why? Dan Ariely is a fatastic writer. This book was every bit as good as predictably irrational. What does Simon Jones bring to the story that you wouldn’t experience if you had only read the book? Simon Jones has a wonderful voice and his emphasis and delivery of humour is perfect. I enjoy his narrating so much I have added almost all the books he has narrated to my wishlist. Loved it - Good to understand based on real life situations and how they make sense or not. Entertaining if rather slight. Unnecessary for anyone who has read Predictably Irrational. Simon Jones excellent.